Initial reactions were all about the looks: “mean” (wife), “angry” (teenager), “scary” (7- year-old), “spivvy” (artist friend) were the comments. I got used to the looks after a while, although I continued to struggle with the strange black plastic panels at each of the four corners pretending to be air vents from a Lamborghini. In fact, the rear ones are solid and not vents at all, so I guess their real purpose must be to save paint. The bizarre styling extends to the door mirrors, which look as if a horse has bitten a chunk out of them. 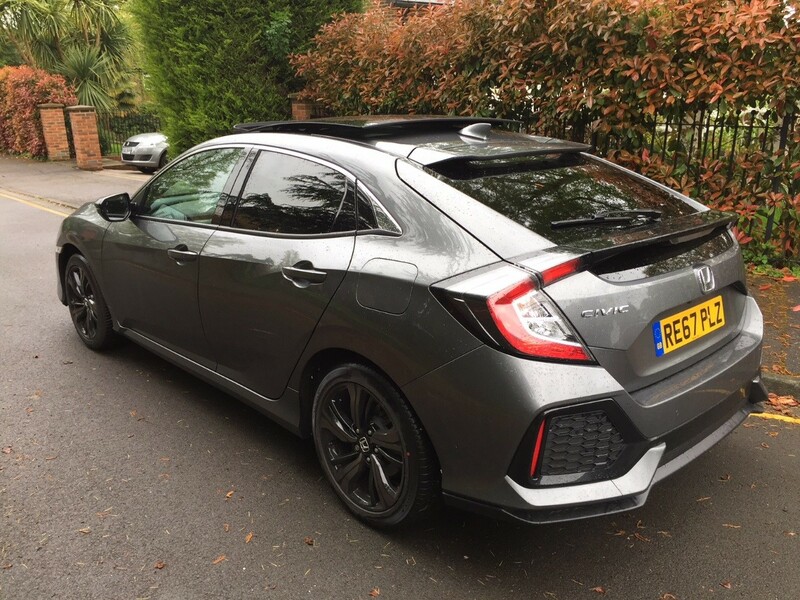 The new Civic is the tenth series and has grown up and put on weight in much the same way as I have in the intervening years. I drove both the new 1.6 diesel engine Civic SR (£22,065) and also the 1.0 turbo petrol EX (£23,615), both with six speed manual gearboxes. The latest model is big compared with previous models, being notably roomy inside, and with a large boot. The seats seem flat at first but are comfortable with nice side bolsters, although the black cloth on the base spec diesel is a bit drab. The black perforated leather with contrast stitching on the petrol car gives a higher quality feel. The airiness of the EX’s interior in the front is further lifted by the optional glass sunroof, although it’s still a bit dark in the back with the high-sided doors and shallow windows making it hard for young kids to see out. Some compensation is that the rear seat passengers do have plenty of space. Switch on, and you get a short firework display from the instrument panel. You can switch off the rev counter (I can’t think why you would as it is just a ring round the top of the screen), but you’re still left with the annoying graphic that looks like a coffee table which shrinks and grows across the screen to indicate instant fuel consumption. There is a two-tier centre-front console with a concealed lower tray under the top one with HDMI and USB connectors, and a power outlet. Behind this, there is a highly practical centre storage space, with a sliding armrest, and yet another USB connector. Honda has worked hard to make this a really easy car to live with. The iPad-like screen in the middle of the dash is nicely integrated and pretty intuitive and offers all sorts of things you didn’t know you needed, such as Aha app integration. The touchscreen needs to be pressed quite firmly, and you can find yourself prodding the wrong thing whilst being shaken about by the busy and sometimes lumpy ride of the diesel over typical UK roads. 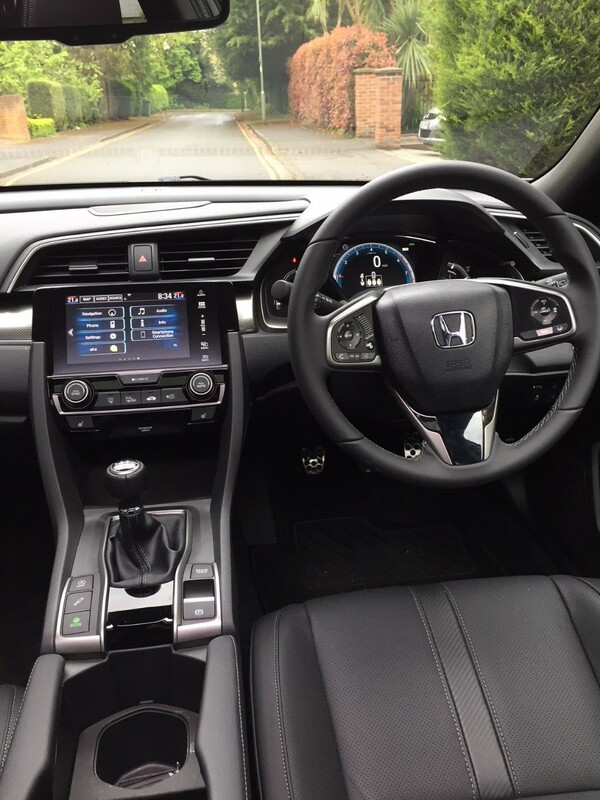 The trade-off for the busy ride is that the car corners flat and well, and steers sharply and accurately, with a nice leather steering wheel and decent weighting giving you plenty of confidence through the bends. The gear change is very fluid and the clutch super smoo­th, making seamless changes a doddle. Of ­­­course, the torque of the new engines helps here. You can’t rush your gear changes though, as both the diesel and petrol engines have a strong flywheel effect and like to hang onto revs. The car in diesel form takes a while to get going, not surprising with only 120bhp to pull along quite a big car, but once on the move the mid-range acceleration is strong, and it feels generally pretty brisk. The engine is decently refined (for a diesel) and doesn’t intrude unpleasantly. The petrol car, by contrast, feels more lively, although it produces only 9bhp more and sounds great with its three-cylinder beat – so much nicer than most four cylinder engines. However, being a modern turbo, it has its torque low down the rev range and is red-lined at 5700 rpm which is a slight disappointment compared with the rev-hungry Honda V-TEC engines of the recent past. No matter, it goes well! The EX level model is fitted with an adaptive damper system which gives a decent ride in normal setting and a rough one in sport. The ride of the non-adaptive diesel SR is somewhere in between these two settings. In both models, the ride is quiet in town, but significant tyre roar builds up with speed on typical dual carriageways, plus some wind noise at 70mph. The car needs its rear-parking camera as rear three-quarter visibility is poor, and the blacked out side and rear windows annoyingly reduce light. The spoiler sits across the rear window and has the wiper mounted on it which also reduces vision. Another minor irritation is the asymmetrical black shaded patch on the windscreen, presumably because the sun visor isn’t wide enough. New owners who suffer from insomnia will be glad of the Civic’s handbook as it is of biblical length, running to 810 pages, and that is not including the 131 page navigation system instructions! The car is certainly packed with features which, as evidenced by the handbook, are too many to list here, and as always with Honda, it is beautifully put together. It’s a good crisp drive in both iterations, and makes a strong case for itself as a thoroughly modern well-equipped package. For me – and like me - it’s grown a little bigger than it needs to now and that’s a shame, though it is the modern trend.